“New research indicates that Webinars [and social media platforms], now well-established as a vital marketing tool for many companies, continue to rise in popularity. Almost 75% of companies surveyed recently by DemandGen Report have increased the frequency of webinars they host […] 84% use webinars for lead generation, 75% have increases frequency of webinars in the past year, more than 50% use LinkedIn and Twitter for webinar promotion […] it’s a 360-degree approach before, during and after a webinar.” – “Maximizing Webinars with Social and Interactive Engagement” by DemandGen. Research sponsored by GoToWebinar in 2010. “1.83M corporate and business meetings, trade shows, conventions, congresses, incentive events and other meetings take place in the U.S., resulting in: $280B in direct spending, 1.78M U.S. jobs, $115B contribution to GDP, $28B in federal, state and local tax revenue, $66.8B in U.S. labor income […] contribution to the U.S. GDP is greater than, for example, motion picture/recording industry ($113B), performing arts/spectator sports/museums ($87B) and information and data processing services ($80B). Combined direct, indirect and induced effects of the meeting industry to GDP total $393B.” – “2012 Economic Significance Study” by PwC for the Convention Industry Council. I am reviewing my notes from a discussion that I facilitated in 2009 here in Chicago. Frost & Sullivan’s Executive MindXchange program invited me as a thought leader to an event focusing on social media in the enterprise environment. We were addressing the future marketing impact of online tools such as webinars and social networking platforms. Some comments pointed to rapid growth cannibalizing budgets otherwise allocated to conventional events. That discussion led to a scenario where companies would undertake more online marketing activities while downsizing the scope and scale of efforts traditionally devoted to industry trade shows and conventions. In hindsight, the paradox is that online communications and social media’s growth might have helped foster participation in conventional events instead. I am thinking of two factors worth considering as follows. First, new technologies have lowered barriers and democratized access to communication channels. There now is a higher signal-to-noise ratio and, therefore, a more pressing need to clearly standout and differentiate. Second, analytics have become of the essence and relationships are king. We are now paying far more attention to metrics dealing with: reputation, engagement depth and quality, meaningful conversations, leads and conversions and, most importantly, experiences and relationships. In this context, meeting in person and capturing someone’s undivided attention with a compelling demonstration experience can make all of the difference. I am thinking of businesses where personal relationships are paramount whether we are talking about decision makers and/or influencers. As a result both online and conventional activities happen to be growing for many of us. 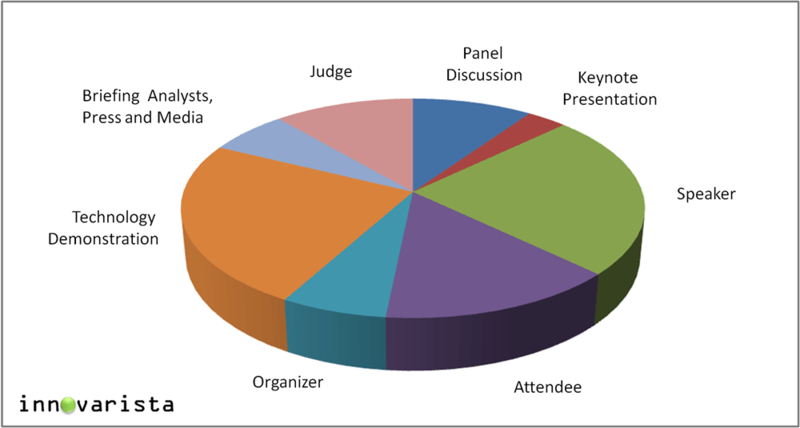 I just took a quick look at my involvement in 50+ industry events since 2008 and created the above chart. I was interested in getting a feel for the relative share of the roles I get to play. Public speaking engagements and demonstrations of emerging and next generation technologies account for 50%. This is intertwined with social media as consultaglobal, my former blog and network on innovation management registered 500,000+ views while innovarista (this new blog) is picking up the pace.